The Cheney Library located at 73 Classic St in Hoosick Falls serves the towns of Hoosick, Pittstown, Buskirk, and White Creek. 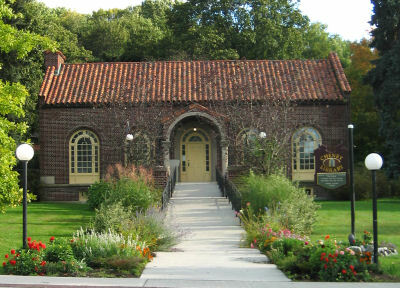 The Cheney Library is a member of the Upper Hudson Library System, a consortium of 28 libraries in Albany and Rensselaer Counties. Through the interlibrary loan service Cheney Library borrowers have access to thousands of books, CD’s, and DVD’s throughout the system. The Cheney Library was a gift to the people of Hoosick Falls from Charles Cheney who, in 1912, left $50,000 in his estate for the construction and support of a library and historical rooms. We are very pleased to inform you that Sara Yetto is our new Library Director. We are looking forward to working with Sara. A detailed introduction will follow soon. Lise Smith of Hoosick, NY, has been hired to fill the position of Library Director of Cheney Library, upon the retirement of Carol Gaillard at the end of January. Lise worked with Carol for the first month of her employment, before taking over on her own, February 1, 2018.